A link to "View devices connected to your Comcast Business Private WiFi network" will be sent via email. Your link to 'View devices connected to your Comcast Business Private WiFi network' has been sent! 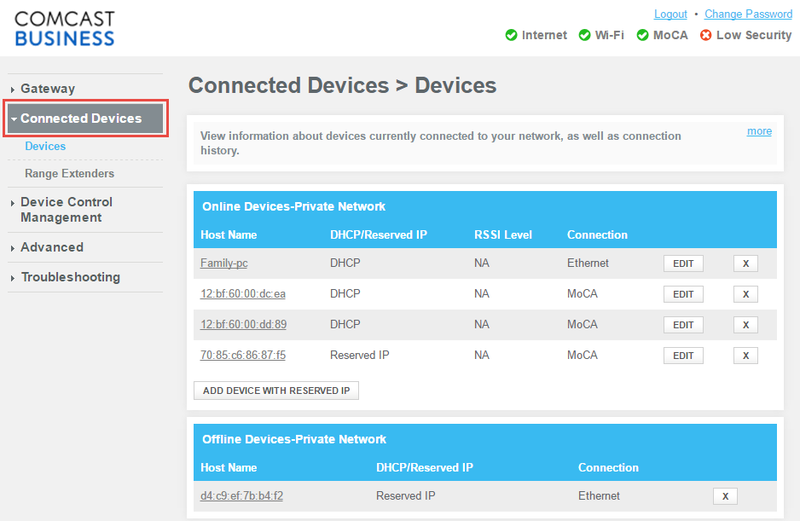 There are multiple ways to determine the devices currently connected to your Comcast Business Private WiFi network. If you are experiencing wireless and/or general connectivity issues, confirming the list of connected devices is an important troubleshooting step. Open a web browser from a connected wired or WiFi device. Enter http://10.1.10.1 in the URL field and press Enter. ​When prompted, enter your username and password. Select Login. If this is your first time logging in, enter cusadmin as the Username. Enter highspeed or CantTouchThis as the Password. Note: The username cusadmin cannot be changed. To ensure better security for your network, change the default password to a password of your own. Select Connected Devices and then select Devices. Ethernet: device is connected directly to the BWG or CBR through an Ethernet cord. WiFi 2.4G or WiFi 5G: device is connected wirelessly to the BWG or CBR. MoCA: device is connected wirelessly to the Wireless Extender. Connect directly to the router. Launch a browser window from your computer. Enter http://www.routerlogin.com in the URL field. Enter the admin User name and password. Select Basic, then select Attached Devices. IP Address: The IP address that the router assigned to this device when it joined the network. Note that this number can change if a device is disconnected and rejoins the network. MAC Address: The unique MAC address for each device does not change. The MAC address is typically shown on the product label. Device Name: If the device name is known, it is shown here. Learn how easy it is to install and set up your Comcast Business Private WiFi Netgear router. If you are having connectivity issues with your Business Private WiFi network, follow these instructions to troubleshoot.